European MPs have voted against allowing scientists to carry out research on stem cells taken from embryos. The vote by members of the European Parliament (MEPs) could now see this type of research outlawed across the EU. At present, it is legal in the UK but is banned in other member states, while others have no regulations at all. MEPs will have to vote on the proposed new law again before it can come into effect. It also needs the support of individual member states. However, if a majority of EU ministers back the proposal this type of research could come to an end in the UK. Supporters of stem cell research say it could hold the key to cures for a wide range of serious diseases, including Alzheimer's and Parkinson's. Stem cells are cells at an early stage of development which have the potential to turn into many different types of tissue. 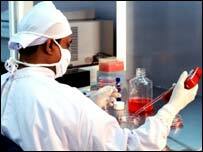 They can be taken from adult tissue samples, or samples taken from human embryos. It is thought that embryonic stem cells may prove to be much more versatile in being adapted for medical use than adult cells. But opponents say it is unethical to use embryos because they represent the first stages of human life and it should be banned. Under the proposals, cloning for human reproduction will be outlawed and research using embryonic stem cells will be restricted. There would also be new rules on obtaining tissue samples. Critics say these would make research impractical or too expensive. David Bowe, Labour's environment spokesman in the European Parliament, criticised the result. "I am quite annoyed about it. It is wrong for the religious right to assert its own moral view on the rest of us. "There is no moral consensus in Europe on this and it really should be left up to individual member states to decide." Mr Bowe said he was confident the proposed ban could be defeated when the legislation is considered again by MEPs. "We are going to start working very hard to ensure these amendments don't go through," he told BBC News Online. But Maria Louise Flemming, the Austrian Christian Democrat MEP who tabled the amendments calling for the ban, defended the result. "From the moment of the conception, you create all the individual characteristics of a person," she said. British experts have criticised the vote in the European Parliament in Strasbourg. Sir George Radda, chief executive of the Medical Research Council, said: "We are very disappointed with this initial vote. If it were to lead to legislation it would severely limit embryonic stem cell research and its potential to combat serious human diseases." Professor Lord May of Oxford, president of the Royal Society, said: "We are very disappointed that the European Parliament has backed this cynical manipulation of the legislative process by a small minority who want to overturn the rights of individual member states to make their own democratic decisions about whether to allow research on human embryonic stem cells and therapeutic cloning." Linda Kelly, chief executive of the Parkinson's Disease Society, criticised the vote. "The result of today's vote is potentially a major step backwards," she said. Annwen Jones, chief executive of the Juvenile Diabetes Research Foundation, said: "We are disappointed at the result of this vote and its implications for research towards a cure for diabetes, in which so much progress has been made, as well as for many other conditions. "The UK has the best environment for this type of research and it is imperative it continues." Dr Moira Murphy, director of research at Diabetes UK, said: "People with diabetes deserve the best possible chance in life. Stem cell research using embryonic cells could one day provide a cure. The people of Britain have said they are in favour of this research. "Our doctors should be allowed to try and put an end to the daily injections and the threat of blindness, heart disease and amputations which are part of the life of people with diabetes." A survey published this week suggested a majority of Britons backed the use of human embryos for medical research in certain circumstances.